Ryder and the Paw Patrol gang are making their console and PC gaming debut in a brand new adventure. Does the game live up to the quality of the TV series, or should you find some other way to keep your kiddos busy? No job is too big, and no pup is too small. The animated Paw Patrol TV series has been showing kids how to use teamwork and giving them positive messages since 2013. The group of puppies is guided by their human boy Ryder, with each puppy having a unique job to do and a uniform and back pack full of tools to match. You’ve got a fire pup, a construction and demolition pup, a flying pup, a police pup, and more. It’s up tio Ryder to guide them on their missions in order to rescue who or what is in danger. The video game follows along these same lines and brings with it a bunch of adventures for kids to play through. 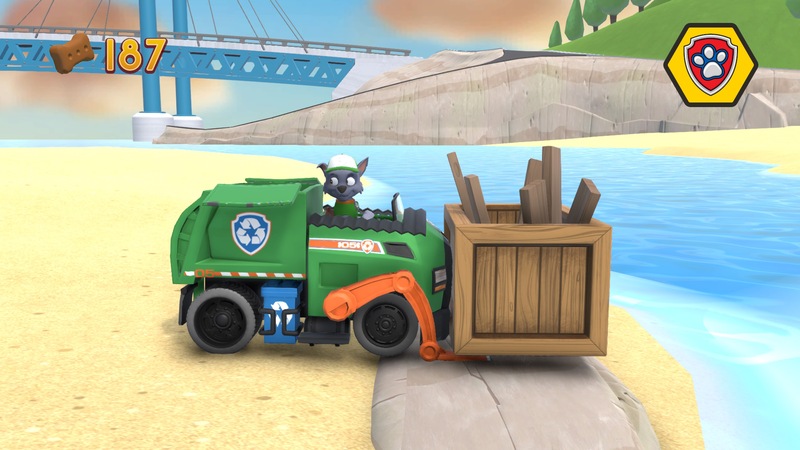 Paw Patrol On a Roll starts out with Ryder telling you about your first rescue mission. It appears some small ducks are stuck in a pond with the water level too low for them to climb out, and the path to them is a bit of a maze. Each mission is split into two parts, and requires two different characters to complete. The first mission has you starting out as the police pup Chase, a young German Shepherd, and then at the half way point you switch over to the fire pup Marshall, a young Dalmatian. Each character has their own unique set of backpack tools at their disposal, and when it comes time to use them, Ryder asks you which one you want to use. Answering wrong is of no consequence, and you can just press the correct button and get to work. It’s a simple system that works well with little ones and doesn’t require a lot of memory work. As you play through each mission, you’ll occasionally come across an obstacle you can’t deal with on your own so you’ll have to yelp for help. Maybe there are seagulls blocking the path and you can call up Chase to blast his siren in his police car, or maybe there’s boulders and you need the bulldog Rubble to come bulldoze them out of the way. Whatever the case, Ryder guides you to yelp for help and all you have to do is press the correct button and the proper puppy is summoned. The game is a great introductory lesson on basic platforming for small children and will teach them how to maneuver through jumps and double jumps, all the while teaching them how collectibles work as well. 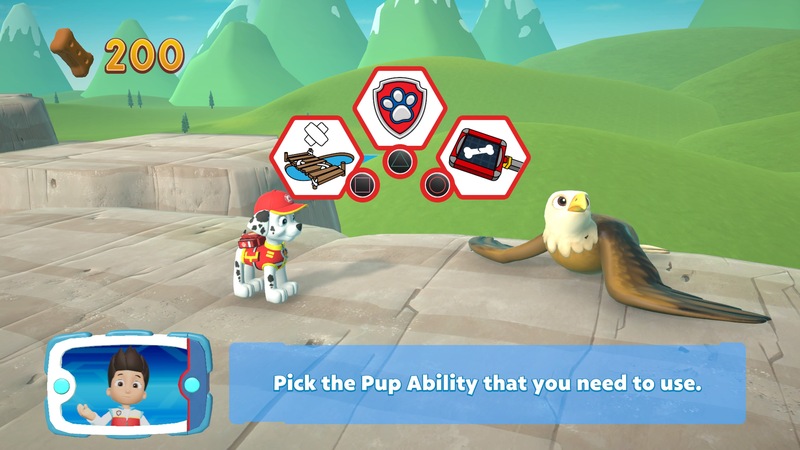 Each level has 200 pup treats to pick up and 5 Gold Paws to collect. While the paws are almost completely unmissable, and Ryder tells you when one is near by, those 200 pup treats can be tricky. You’ll have backtrack many times if you want to grab them all, and if you miss one you’ll have to start back at the beginning of the level at zero again. Finishing at 199 can make for some sad faces. The few puzzles in the game aren’t very challenging, and that’s OK. Building bridges by matching patterns is about the extent of them, but the game is catered to small children and they can pick-up and play by themselves pretty easily. The game really does a great job of tying in all of the pups from the series and utilizes their unique skill-sets well. 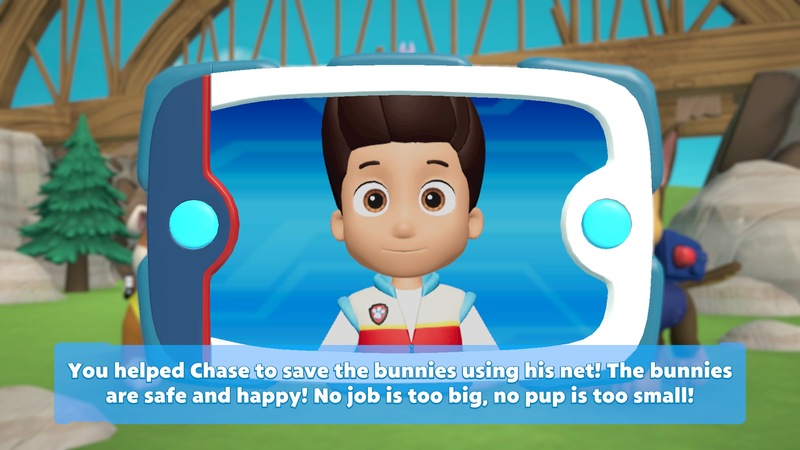 After having sat through many TV episodes of the series, the game really does stay true to the Paw Patrol series and the messaging they have always sent out. The graphics are almost identical to the TV series and the background music is light and fun. If you have a young Paw Patrol fan around the house, or if you are looking for a gift for a grandkid that loves the series, they’ll really enjoy this game. 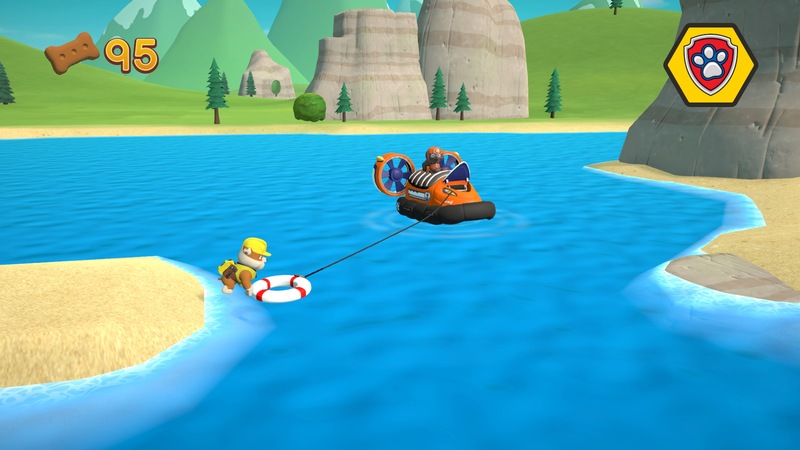 Paw Patrol: On a Roll review code provided by publisher. For more information on scoring, please read: What our review scores really mean.